Need more than words to get your marketing message across? With MMS services from SimpleTexting, you can add engaging multimedia content like photos, videos, and animations. That’s a whole new level of texting. What Is An MMS Message Service? MMS stands for “Multimedia Messaging Service”. MMS marketing helps your business elevate digital communications by sending messages that include multimedia content to and from mobile devices. MMS messages can include things like images, videos, and sound files. Because most smartphones are MMS enabled by nature, we often don’t realize that sending photos and videos to friends and family is actually an entirely different process than text messaging. That’s the behind the scenes magic of MMS! When considering ways to improve your digital communications, utilizing MMS is an easy upgrade. MMS creates a space for you to repurpose your artfully cultivated social media images, fresh product photos, demo videos, and more. In an increasingly visual society, the capacity to show vs. tell could be the missing link in your messaging. 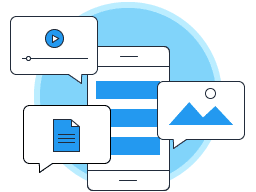 In addition to its ability to send rich media directly, meaning without links, MMS services include up to 1,600 characters instead of the traditional 160! Dog Days Animal Rescue just received a litter of puppies in need of fur-ever homes. Respond YES if you’re interested in our adoption event this Saturday at the shelter! MMS campaigns get 20% more opt-ins than SMS campaigns. People are 8 times more likely to share MMS content. MMS marketing puts the picture power right where it should be—in your hands. Do you love words and feel the need to write lots of them? Well, it’s your lucky day, because MMS marketing gives you a whopping 1,600 characters per message. Oh, the texts you can text! MMS has the same great features as SMS, like autoresponders, sweepstakes, and data collection. It’s all right there in the dashboard, ready to work with your cool coupons and cute kitten gifs. Schedule or send MMS messages from a laptop, tablet, or mobile device with SimpleTexting’s easy-to-use mobile app. Our MMS service detects each subscriber’s device and optimizes messages for the best user experience. Send your campaign and leave the rest to us. Worried about the 2% of mobile devices that can’t handle MMS? Don’t be. SimpleTexting lets you set up fallback messages for the SMS-only segment. Where would we be without analytics? Lost in the dark, that’s where. That’s why we’ve made arrangements to keep tabs on your stats for you. Any business looking for creative ways to engage their audience can benefit from an MMS messaging service. The increased character limits and multimedia capabilities can help set you apart from the competition. People are more likely to remember information accompanied by a relevant image. Only 10% of information is retained otherwise. After viewing a product video, people are more likely to make a purchase. Sales conversions are far lower without product media. This means that our brains spend far more time perceiving visual cues when taking in and processing information daily. Use images to visually entice your recipients to click on an offer or link. Articles with images get 94% more total views. You work hard on all your videos and podcasts. Increase the number of people who see your work by drawing them in with a preview and link to the full production! When communicating via text you want to make sure you remain personable and avoid coming across like a robot. Gifs and images are a great way to connect with your audience. Who Can Use MMS Messaging? MMS messaging can benefit a variety of industries. If you need some more help brainstorming we’ve got some guides to help you get started. Try Our MMS Service For Free Today! When you add MMS to your marketing plan, you’ll be following in the footsteps of millions of businesses that already use rich media to engage their audiences, boost customer loyalty, and bump up their bottom line.